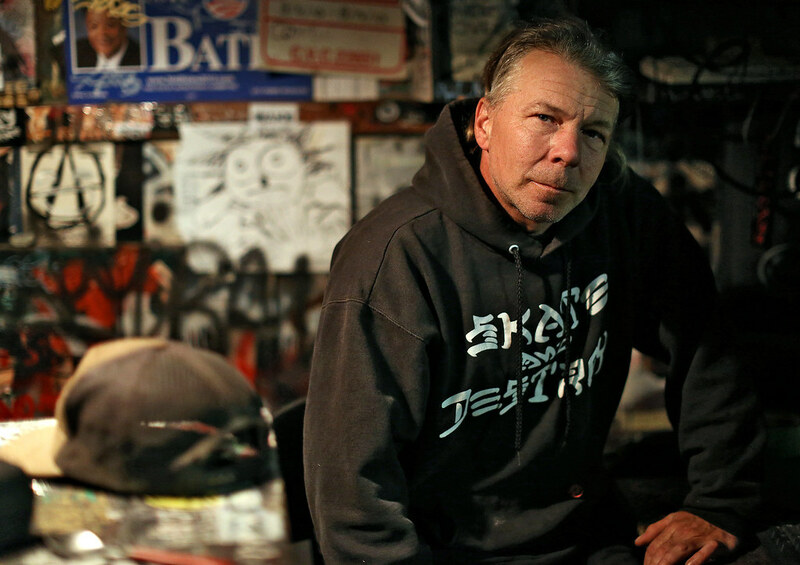 With smoke slowly floating out of his mouth as he sits on the legendary stage that he built at Burnt Ramen, the former underground venue inside the iron triangle of Richmond, John Eppard is at home. At 50, many would consider it time to give up on music, touring and activism, but Eppard has never been one to give up without a fight. Better known as “John The Baker” for his time as a vegan baker, the political musician is synonymous with Bay Area punk. Eppard was arrested in 1994 for the lyrical content of his songs in the town of Woodstock by a police officer who felt the songs he was performing contained language too vulgar for children in the park. After being thrown in jail and released on a $250 bail, Eppard decided — like he has many times in his life — to fight back. “The cop thought I was just some transient with a guitar like it always is in Woodstock and he was going to exercise his moral authority. He messed with the wrong guy,” Eppard said, alluding to his family’s musical prominence, which includes several musicians, one of whom is in the band Coheed and Cambria. Over the course of the next couple of months, Eppard proved in court that his arrest was unconstitutional and sued the town of Woodstock for $1 million, settling out of court for $20,000. Over the next three years, Eppard “collected dirt” on Shawn Ost, the officer who arrested him. Eppard talked to members of the city board, and they had the New York State Police lodge a secret investigation against the Woodstock Police Department. Eppard’s song, along with the findings of the police investigation led to the termination of Chief of Police, Tim Keefe, and Ost, Eppard’s arresting officer. “That was when one of the ladies on the town’s board who was sympathetic to my cause came to me and said ‘Ok John, now it’s time for you to get out of town, I can take the heat a lot better than you,'” Eppard said. So that’s what he did. He took the money from the settlement, put out a record and toured the country. Eventually he landed in Richmond, Calif., where he helped Mykee Ramen turn a warehouse into a no-rules underground venue that would become one of the biggest hubs for local and touring bands to play. “We would talk all the time about ‘the vision’ that we shared. We were going to get something going in the middle of nowhere,” Ramen said, busy picking up empty beer cans in between two skate ramps that are set up inside the warehouse he owns and lives in. Now on the other side of the country, Eppard has continued his activism through his music. His band, Fucktard, released a free EP called “Corporate Rats” in support of the Occupy movement. Scotty Heath, owner of Tankcrimes records who digitally released the Fucktard’s EP said that Eppard has a way of “living by example,” rather than pushing his beliefs. Eppard also runs a yearly chain of concerts where groups of kids skate all across the bay to each show, getting sponsors for each mile called Skate Til U Die. Half of the money collected last year was donated to Occupy Oakland. This year, the money will go towards the Music Cares foundation. He held a benefit concert for the punk kids in Indonesia who made the news when they were forced to shave their heads, bathe in a river and pray to God. But Eppard isn’t interested in forcing his beliefs on anyone in the scene, or pursuing those who disagree — he just wants people to speak their own mind. Skate Til U Die 2013 takes place at venues around the Bay Area, May 17-19. Editor’s note: A portion of this story was removed because its factual accuracy could not be determined.